21. Decides to remain actively seized of the matter. · Comprehensive approach to the economic development and stabilization of the crisis region. 1. An immediate and verifiable end of violence and repression in Kosovo. 2. Verifiable withdrawal from Kosovo of all military, police and paramilitary forces according to a rapid timetable. 3. Deployment in Kosovo under United Nations auspices of effective international civil and security presences, acting as may be decided under Chapter VII of the Charter, capable of guaranteeing the achievement of common objectives. 4. The international security presence with substantial North Atlantic Treaty Organization participation must be deployed under unified command and control and authorized to establish a safe environment for all people in Kosovo and to facilitate the safe return to their homes of all displaced persons and refugees. 5. 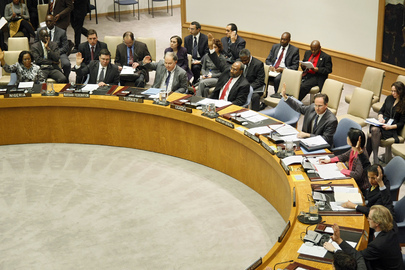 Establishment of an interim administration for Kosovo as a part of the international civil presence under which the people of Kosovo can enjoy substantial autonomy within the Federal Republic of Yugoslavia, to be decided by the Security Council of the United Nations. The interim administration to provide transitional administration while establishing and overseeing the development of provisional democratic self-governing institutions to ensure conditions for a peaceful and normal life for all inhabitants in Kosovo. · Maintaining a presence at key border crossings. 7. Safe and free return of all refugees and displaced persons under the supervision of the Office of the United Nations High Commissioner for Refugees and unimpeded access to Kosovo by humanitarian aid organizations. 8. A political process towards the establishment of an interim political framework agreement providing for substantial self-government for Kosovo, taking full account of the Rambouillet accords and the principles of sovereignty and territorial integrity of the Federal Republic of Yugoslavia and the other countries of the region, and the demilitarization of UCK. Negotiations between the parties for a settlement should not delay or disrupt the establishment of democratic self-governing institutions. 9. A comprehensive approach to the economic development and stabilization of the crisis region. This will include the implementation of a stability pact for South-Eastern Europe with broad international participation in order to further promotion of democracy, economic prosperity, stability and regional cooperation. · Rules governing their relationship to the international security presence and the international civil mission. · The discussion and achievement of a military-technical agreement shall not extend the previously determined time for completion of withdrawals.